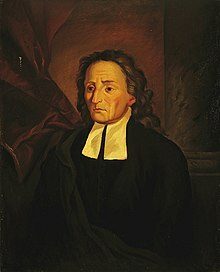 Giambattista Vico (born Giovan Battista Vico /ˈviːkoʊ/, Italian: [ˈviko]; 23 June 1668 – 23 January 1744) was an Italian political philosopher and rhetorician, historian and jurist, of the Age of Enlightenment. He criticized the expansion and development of modern rationalism, was an apologist for Classical Antiquity, a precursor of systematic and complex thought, in opposition to Cartesian analysis and other types of reductionism, and was the first expositor of the fundamentals of social science and of semiotics. Maistre, Coleridge, Hegel, Marx, Croce, Gramsci, Joyce, Michelet, Quinet, Auerbach, McLuhan, Hillman, Frye, Castoriadis, Preve, Hösle, Voegelin, Berlin, Sorel, Collingwood, White, Evola. The Latin aphorism Verum esse ipsum factum ("What is true is precisely what is made") coined by Vico is an early instance of constructivist epistemology. He inaugurated the modern field of the philosophy of history, and, although the term philosophy of history is not in his writings, Vico spoke of a “history of philosophy narrated philosophically." Although he was not an historicist, contemporary interest in Vico usually has been motivated by historicists, such as Isaiah Berlin, an historian of ideas, Edward Said, a literary critic, and Hayden White, a metahistorian. Giambattista Vico's intellectual magnum opus is the book Scienza Nuova (1725, New Science), which attempts a systematic organization of the humanities as a single science that recorded and explained the historical cycles by which societies rise and fall. Born to a bookseller in Naples, Italy, Giovan Battista Vico attended several schools, but ill health and dissatisfaction with the scholasticism of the Jesuits led to his being educated at home by tutors. Evidence from his autobiographical work indicates that Vico likely was an autodidact educated under paternal influence, during a three-year absence from school, consequence of an accidental fall when the boy was seven years old. Giovann Battista’s formal education was at the University of Naples from which he was graduated in 1694, as Doctor of Civil and Canon Law. In 1686, after surviving a bout of typhus, he accepted a job as a tutor, in Vatolla, south of Salerno, which became a nine-year professional engagement that lasted till 1695. Four years later, in 1699, Vico married Teresa Caterina Destito, a childhood friend, and accepted a chair in rhetoric at the University of Naples, which he held until ill-health retirement, in 1741. Throughout his academic career, Vico would aspire to, but never attain, the more respectable chair of jurisprudence; however, in 1734, he was appointed historiographer royal, by Charles III, King of Naples, at a salary greater than he had earned as a university professor. Vico's version of rhetoric is product of his humanistic and pedagogic concerns. In the 1708 commencement speech De Nostri Temporis Studiorum Ratione (On the Order of the Scholarly Disciplines of Our Times), Vico said that whoever “intends a career in public life, whether in the courts, the senate, or the pulpit” should be taught to “master the art of topics and [to] defend both sides of a controversy, be it on Nature, Man, or politics, in a freer and brighter style of expression, so he can learn to draw on those arguments which are most probable and have the greatest degree of verisimilitude”; yet, in Scienza Nuova, Vico denounced defending both sides in controversies as false eloquence. As Royal Professor of Latin Eloquence, Vico prepared students for higher studies in the fields of Law and of Jurisprudence; thus, his lessons were about the formal aspects of the canon of rhetoric, including the arrangement and the delivery of an argument. Yet, Vico chose to emphasize the Aristotelian connection of rhetoric with logic and dialectic, thereby placing ends (rhetoric) at their center. Vico's objection to modern rhetoric is that it is disconnected from common sense (sensus communis), defined as the “worldly sense” that is common to all men. In lectures and throughout the body of his work, Vico's rhetoric begins from a central argument (medius terminus), which is to be clarified by following the order of things as they arise in our experience. Probability and circumstance retain their proportionate importance, and discovery — reliant upon topics (loci) — supersedes axioms derived through reflective, abstract thought. In the tradition of classical Roman rhetoric, Vico sets out to educate the orator (rhetorician) as the transmitter of the oratio, a speech with ratio (reason) at the centre. What is essential to the oratorical art (Gr. ῥητορική, rhētorikē) is the orderly link between common sense and an end commensurate with oratory; an end that is not imposed upon the imagination from above (in the manner of the moderns and dogmatic Christianity), but that is drawn from common sense, itself. In the tradition of Socrates and Cicero, Vico's true orator will be midwife to the birth of “the true” (as an idea) from “the certain”, the ignorance in the mind of the student. Rediscovery of "the most ancient wisdom" of the senses, a wisdom that is humana stultitia (“human foolishness”), Vico's emphases on the importance of civic life and of professional obligations are in the humanist tradition. He would call for a maieutic (jurisprudential) oratory art against the grain of the modern privilege of the dogmatic form of reason, in what he called the “geometrical method” of René Descartes and the logicians at the Port-Royal-des-Champs abbey. The New Science (1725, Scienza Nuova) is his major work and has been highly influential in the philosophy of history, and for historicists such as Isaiah Berlin and Hayden White. Samuel Beckett's first published work, in the selection of critical essays on James Joyce entitled Our Exagmination Round His Factification for Incamination of Work in Progress, is "Dante... Bruno. Vico.. Joyce". In it, Beckett sees a profound influence of Vico's philosophy and poetics — as well the cyclical form of the Scienza Nuova — on the avant-garde compositions of Joyce, and especially the titular Work in Progress, viz. Finnegans Wake. In Knowledge and Social Structure (1974), Peter Hamilton identified Giambattista Vico as the “sleeping partner” of the Age of Enlightenment. Despite having been relatively unknown in his 17th-century time, and read only in his native Naples, the ideas of Vico are predecessors to the ideas of the intellectuals of the Enlightenment. Moreover, recognition of Vico’s intellectual influence began in the 19th century, when the French Romantic historians used his works as methodological models and guides. In Capital: Critique of Political Economy (1867), Karl Marx’s mention of Vico indicates their parallel perspectives about history, the role of historical actors, and an historical method of narrative. Marx and Vico saw social-class warfare as the means by which men achieve the end of equal rights; Vico called that time the "Age of Men". Marx concluded that such a state of affairs is the optimal end of social change in a society, but Vico thought that such complete equality would lead to socio-political chaos and the consequent collapse of society. In that vein, Vico proposed a social need for religion, for a supernatural Divine Providence to keep order in human society. Opere di G.B. Vico. Fausto Nicolini (ed. ), Bari: Laterza, 1911-41. De Antiquissima Italorum Sapientia ex Linguae Originibus Eruenda Librir Tres (On the Most Ancient Wisdom of the Italians Unearthed from the Origins of the Latin Language). 1710, Palmer, L.M., trans. Ithaca: Cornell UP, 1988. Institutiones Oratoriae (The Art of Rhetoric). 1711-1741, Pinton, Girogio, and Arthur W. Shippee, trans. Amsterdam: Editions Rodopi B.V., 1984. * "On Humanistic Education", trans. Giorgio A. Pinton and Arthur W. Shippee. Ithaca: Cornell UP, 1993. On the Study Methods of Our Time, trans. Elio Gianturco. Ithaca: Cornell UP, 1990. On the Most Ancient Wisdom of the Italians: Unearthed from the Origins of the Latin Language, trans. L.M. Palmer. Ithaca, Cornell UP, 1988. Scienza Nuova (The First New Science). 1725, Pompa, Leon, trans. Cambridge: Cambridge UP, 2002. The New Science of Giambattista Vico, (1744). trans. Thomas G. Bergin and Max H. Fisch. Ithaca: Cornell UP, 2nd ed. 1968. ^ Ernst von Glasersfeld, An Introduction to Radical Constructivism. ^ Bizzell and Herzberg, The Rhetorical Tradition, p. 800. ^ The contemporary interpretation of Vico is by Verene, Donald Philip. See: "Giambattista Vico" (2002), A Companion to Early Modern Philosophy, Steven M. Nadler, ed. London:Blackwell Publishing, ISBN 0-631-21800-9, p. 570. ^ Giambattista Vico (1976), "The Topics of History: The Deep Structure of the New Science", in Giorgio Tagliacozzo and Donald Philip Verene, eds, "Science of Humanity", Baltimore and London:1976. ^ Giambattista Vico: An International Symposium. Giorgio Tagliacozzo and Hayden V. White, eds. Johns Hopkins University Press: 1969. Attempts to inaugurate a non-historicist interpretation of Vico are in Interpretation: A Journal of Political Philosophy , Spring 2009, Vol. 36.2, and Spring 2010 37.3; and in Historia Philosophica, Vol. 11, 2013 . ^ The Penguin Encyclopedia (2006), David Crystal, ed., p. 1,409. ^ a b c d Costelloe, Timothy. "Giambattista Vico". Retrieved 6 March 2014. ^ a b Hamilton, Peter (1974). Knowledge and Social Structure. London: Routledge and Kegan Paul. p. 4. ISBN 978-0710077462. ^ Marx, Karl. Capital, Book 1. pp. Book 1, part IV, chapter 13, n. 89 (footnote). ^ Chaix-Ruy, Jules-Marie. "Giambattista Vico". Encyclopædia Britannica. Retrieved 6 March 2014. ^ a b c d Said, Edward (2003) . Orientalism. Penguin Classics. pp. xviii, 4–5. Chisholm, Hugh, ed. (1911). "Vico, Giovanni Battista" . Encyclopædia Britannica. 28 (11th ed.). Cambridge University Press. Fabiani, Paolo. "The Philosophy of the Imagination in Vico and Malebranche". F.U.P. (Florence UP), Italian edition 2002, English edition 2009. Andreacchio, Marco. "Epistemology's Political-Theological Import in Giambattista Vico" in Telos. Vol. 185 (2019); pp. 105-27. Giannantonio, Valeria. Oltre Vico – L'identità del passato a Napoli e Milano tra '700 e '800, Carabba Editore, Lanciano, 2009. Gould, Rebecca Ruth. “Democracy and the Vernacular Imagination in Vico’s Plebian Philology,” History of Humanities 3.2 (2018): 247–277. Lilla, Mark. G. B. Vico: The Making of an Anti-Modern. Cambridge, MA: Harvard University Press, 1993. Wikimedia Commons has media related to Giambattista Vico. Rafferty, Michael (1913). "VICO (1668-1744)". In Macdonell, John; Manson, Edward William Donoghue (eds.). Great Jurists of the World. London: John Murray. pp. 345–389. Retrieved 11 March 2019 – via Internet Archive.